Scorpius, one of the most photogenic of constellations, contains a wealth of amazing sky sights. My trip to the land down under is coming to an end but I’m still working through the dozens of deep-sky images I was able to take under the southern stars. 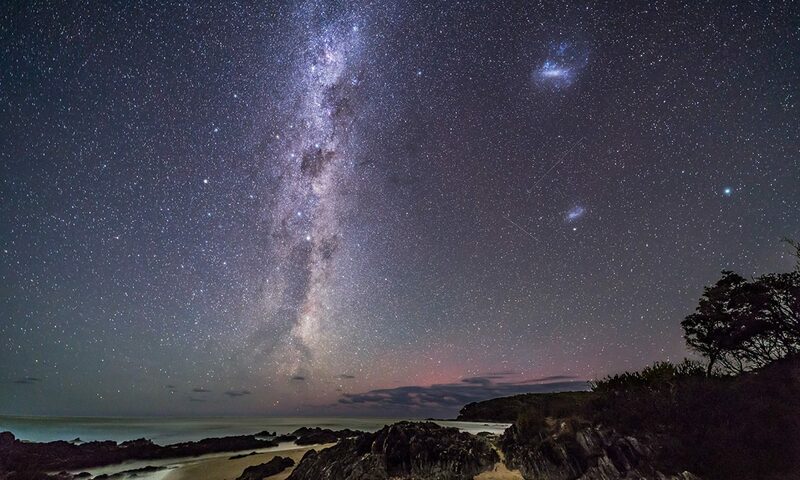 The wide-field scene above takes in all of Scorpius, shot with the constellation sitting directly overhead in the pre-dawn hours of an austral autumn. You can trace the scorpion’s winding shape down from his head and claws at top, to his curving stinger tail at bottom. Off the stinger of the scorpion shine two naked-eye star clusters, Messier 6 and 7 (the close-up photo above). 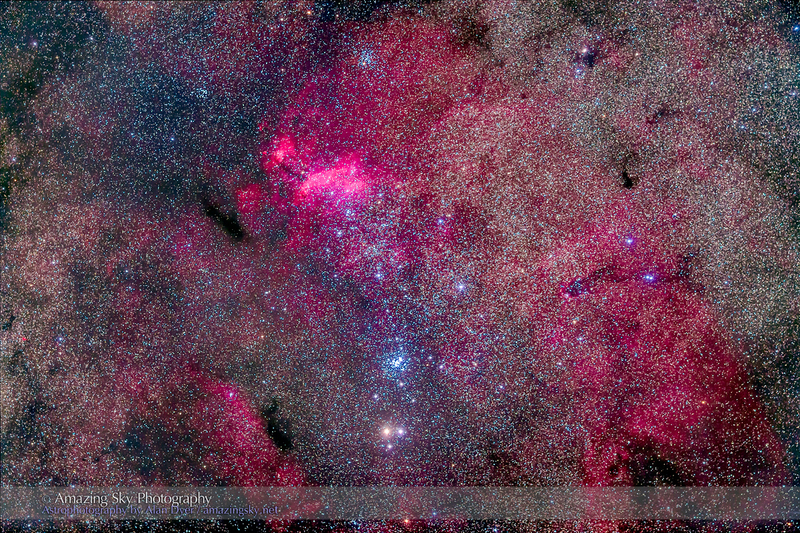 M6 is the Butterfly Cluster, seen here sitting in a dark region of the Milky Way at upper right. Its companion, M7, a.k.a. 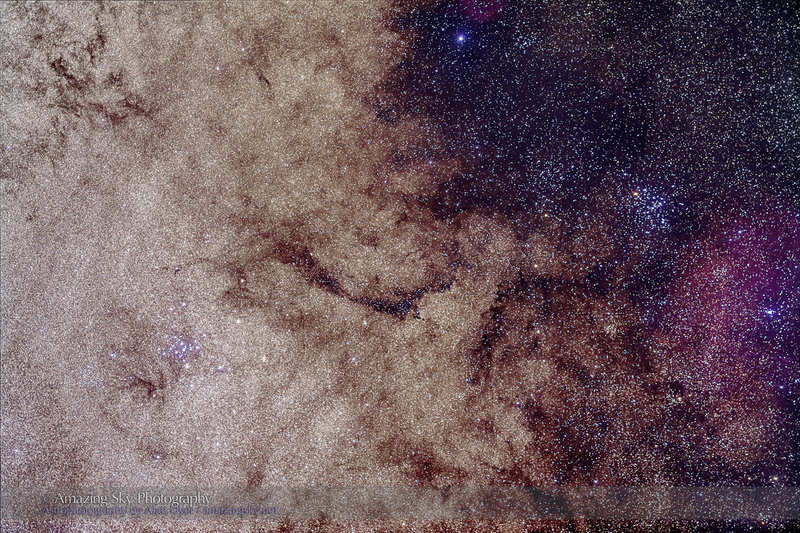 Ptolemy’s Cluster at left of the frame, is lost amid the bright star fields that mark the direction of the galactic core. In the curving tail of the scorpion lie two patches of nebulosity. 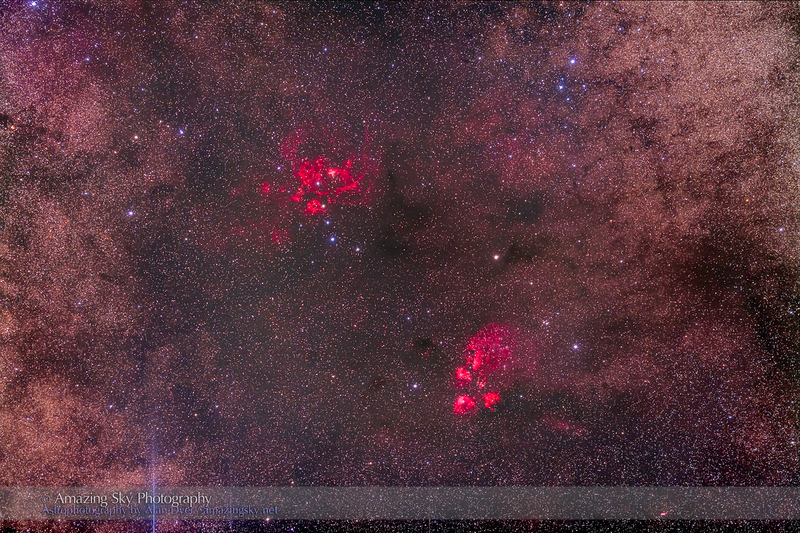 At upper left is NGC 6357, but the triple-lobed NGC 6334 at bottom right is also known as the Cat’s Paw Nebula. Further up the tail of the scorpion sits this fabulous region of space that is a stunning sight in binoculars. NGC 6231 is the blue star cluster at bottom, which garnered the name The False Comet Cluster back in early 1986 when many people mistook its fuzzy naked eye glow for Comet Halley then passing through the area. The camera reveals the region filled with glowing hydrogen gas. But the standout region of Scorpius lies at its heart. Here, the yellow-orange star Antares lights up a dusty nebula surrounding it, reflecting its yellow glow. 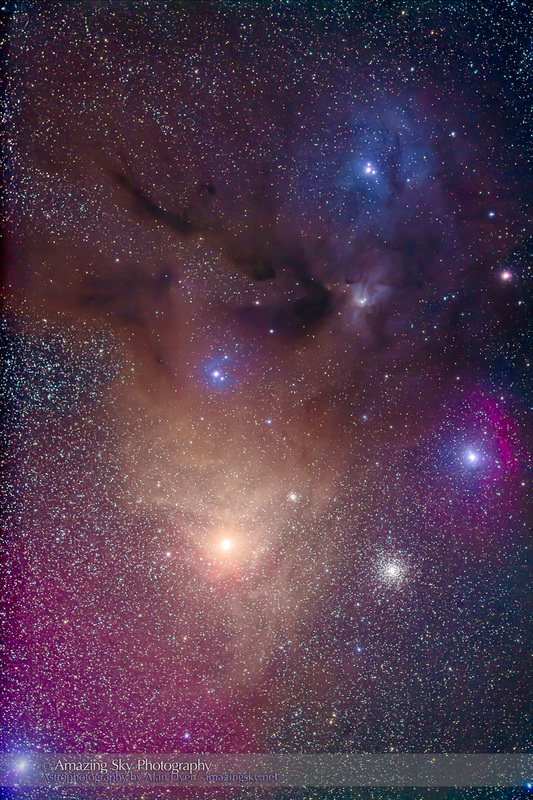 At top, another dusty nebula surrounds the star Rho Ophiuchi, reflecting its blue light. Glowing hydrogen gas adds its characteristic magenta tints. 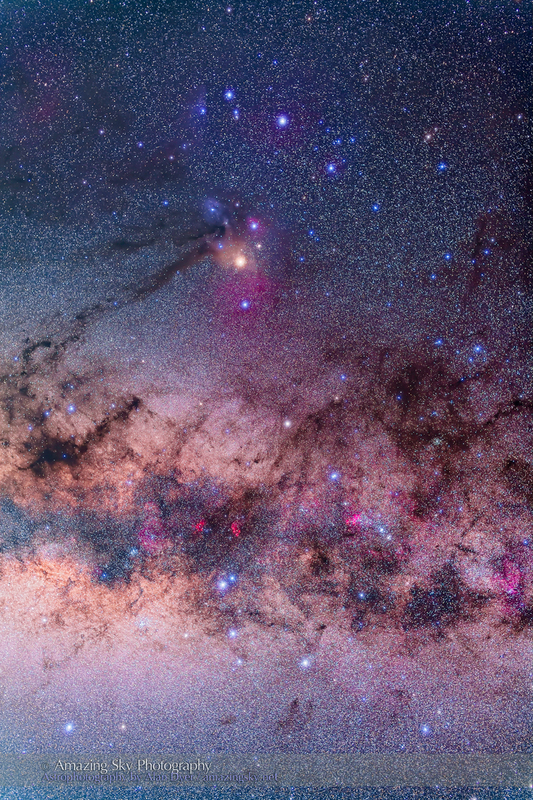 This is one of the most colourful regions of the Milky Way. I shot these images with 50mm normal and 300mm telephoto lenses two weeks ago during the OzSky Star Safari near Coonabarabran, NSW, Australia. For all I used a filter-modified (by Hutech) Canon 5D Mark II camera.